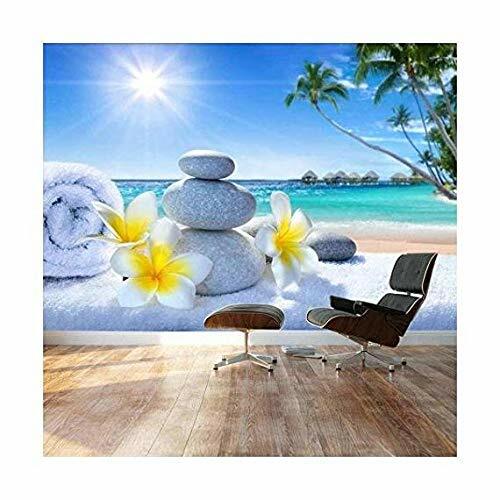 Wall26 - Large Wall Mural - Spa Treatment on Tropical Beach | Self-adhesive Vinyl Wallpaper/Removable Modern Decorating Wall Art - 66"x96"
easy it stick on wall (has adhesive). recommend having an exacto knife for cutting to shape after its on the wall. and putty scraper/wallpaper spreader to make application smooth with no creases. my husband is a perfectionist so he made ours flawlessly applied with no bubbles but the wood texture will hide any imperfection. 2 people would be best, one to hold it while the other presses it down. has a slight sheen to it but not too shiny at all. doesn't look vinyl - could be passable as real wood. for our wall we bought 2 sets for this length and had leftovers. I am confident it will be just fine. I put this on a textured wall, and had zero issues. It looks fabulous. It is actually more orange than gold, but it works. I did have some difficulty lining up the images, and some of then are slightly off, but it's not obvious. I put up the whole thing by myself, and it didn't take that long. I used a box cutter to get the excess off the bottom since it was just a little too long for my wall (I have standard size walls). I love it. When I walk into my bedroom now, it feels rich and luxurious. Love how it looks! Was a bit harder to put up than I thought it would be there are some bubbles/creases that we just can’t get out but it’s not to noticeable unless your right up to the wall. Makes for a good accent wall and a lot cheaper than the wood planks. This is really cool, vibrant color, if you’re a Klimt fan, you’ll love it. But, challenging to match the pattern from one section to the next. And REALLY sticking, like fly paper sticky. So, make it a two person job when you attempt it. I wish I had. If I did, mine may be on the wall. Instead of in the trash.? This looks great! We get complements on it all the time, people think it's real even up close. The pattern repeats horizontally but only every3-4 feet so it's not noticeable. We are renting out our unit and the tenants asked us to leave it up because they liked it so much! Haven't had to remove or reposition so can't speak to that. Would gladly buy again! Looks great, went on with relative ease as long as you have a little bit of patience. Cutting around windows with trim can prove to be a bit tricky, but again, patience will have it looking good in the end.